“La Toscana era l'unico paese al mondo che fosse una «casa»: il resto d'Italia, e Francia, Inghilterra, Spagna, Germania, erano Repubbliche, Monarchie, Imperi, non «case»” (Tuscany was the only country in the world that was a “home”: the rest of Italy, and France, England, Spain, Germany were Republics, Monarchies, Empires, not “homes”), this was Curzio Malaparte's love declaration to Tuscany and it would have been a good slogan for the event at St. John's University on February 22nd. 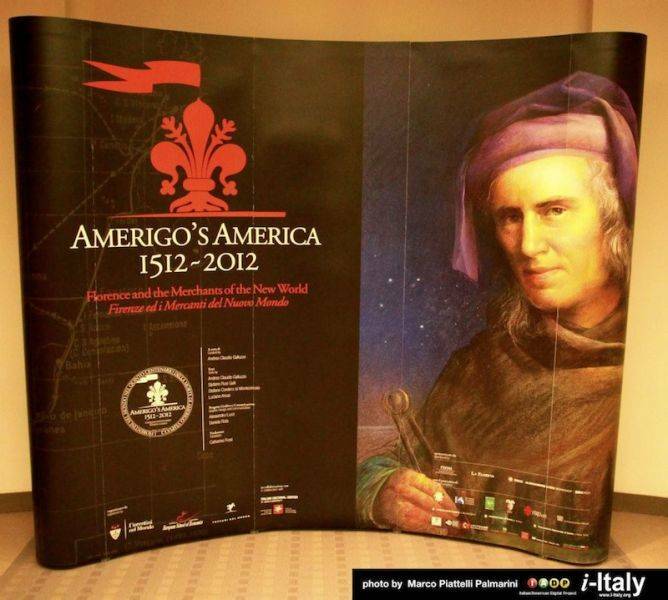 The special celebration was organized in order to commemorate the fifth centenary of Amerigo Vespucci's death. Joseph Sciame, Vice President for Community Relations at St. John’s University and Chairman of St. John’s Italian Cultural Center, made the welcome remarks and presented the conference and the exhibition entitled Amerigo's America (1512-2012), Florence and the Merchants of the New World, made possible by the co-sponsorship of the John D. Calandra Italian/American Institute, with the support of the New York group of Toscani Nel Mondo, headed by Joan Marchi Migliori, the Tuscan Association in the World, the Italian Heritage and Culture Committee of New York and the Columbus Citizens Foundation. 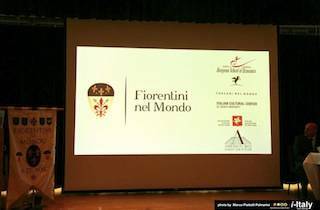 The Fiorentini nel Mondo, Florentines Around the World Association, together with the European School of Economics, in collaboration with the Assembly of Tuscans Around the World and St. John's University, organized this commemorative event on the exact day that marks the 500th anniversary of the death of Amerigo Vespucci. 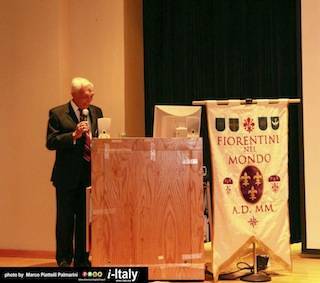 Professor Anthony Julian Tamburri, Dean of the John D. Calandra Italian American Institute, was the moderator of the event and presented the guest speakers for the evening. 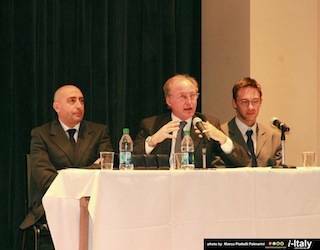 Stefano Cordero di Montezemolo, Academic Director at European School of Economics, Stefano Rosi Galli, Madrid Delegate of Fiorentini nel Mondo Association and Italian Literature teacher and Andrea Claudio Galluzzo, President of Fiorentini nel Mondo Association and historian. 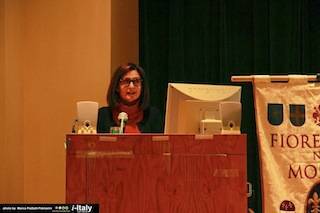 Natalia Quintavalle, Consul General of Italy in New York, was presented by professor Tamburri as the guest of honor. She started by reminding the audience of her origins, “I'm not only the Italian Consul General but the Tuscan Consul General too..” said Quintavalle jokingly. Andrea Claudio Galluzzo awarded her with a special medal, “made in order to honor Vespucci, the man and not the explorer”. He politely asked the audience to stand up and observe one minute of silence. The first of the guest speakers to talk was Stefano Cordero di Montezemolo, who expressed his joy for being part of the panel, “my father lived for 30 years in New York and he would be proud to see me here with you tonight.” Montezemolo lectured about the florentine explorer and about his skills as a merchant. “He received a very special education in a firm, the Medici firm, that created the great renaissance mainly for the economic aspect, he wasn't an explorer in the strict sense.” His importance lies in the fact that he was the first one to recognize America as a new continent and not the West Indies, as Columbus thought. 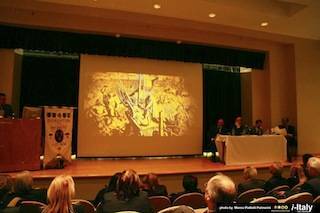 A shy Stefano Rosi Galli started to speak, the audience could notice a hint of emotion in his voice, probably due to his first time in the United States, he talked about Vespucci's connections with the Medici family, his main interests as a scholar. At the end of the event, before inviting everyone to see the exhibit, five other personalities were awarded with the special medals, Joseph Sciame, Anthony Julian Tamburri, Giuliana Cardillo, press officer at the Italian Cultural Institute of New York, Joan Marchi Migliori, head of the New York group of Toscani nel Mondo and Francesco Bardazzi, Fiorentini Nel Mondo’s delegate to New York City. The New York edition of the exhibit will be moved to Tokyo in October 2012.